22 May 2018, at 12:00a.m. Dr Roger Campbell is the CEO of CRC for High Integrity Australian Pork (Pork CRC). Pork CRC uses government and industry money, totalling around $40 million over eight years, to invest in research and training across the Australian pork industry. Pork CRC runs four research programmes: reduced confinement of sows and piglets; animal health management; improving the eating quality of Australian pork; and Carbon conscious nutrient inputs and outputs. The company also has five full time staff and around 43 participants who contribute $2.5 million cash annually and $11.25 million in kind (facilities and staff) annually to the programme. What are the prominent issues regarding pig welfare in Australia? The biggest issue when we started in 2011 was the housing of gestating sows in stalls. Research over the last seven years has resolved the management and other issues associated with maximising the welfare and production of sows housed in groups in gestation, and 80% of industry has transitioned from stalls to groups. Reproduction is excellent (improved) and the major factors affecting sow welfare have been space at mixing; time after mixing; feed type and level; experience of the sow; and stockmen within the system. 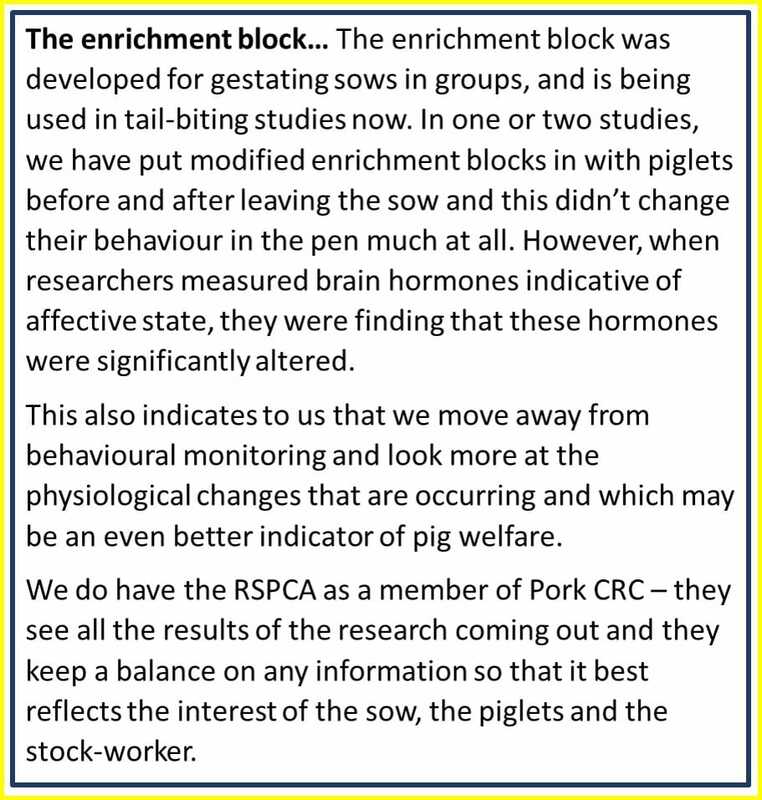 Current issues seem to be around the enrichment of group-housed sows and aggressive-type behaviours of grower-finisher pigs, i.e. tail-biting. There is continued interest shown by the RSPCA, retailers and animal activist groups in reducing confinement during farrowing and lactation but all of our research suggests the systems currently available – swap pens, swing-sided pens and Pig Safe-type pens – have little effect on sow welfare, actually reduce piglet welfare, and have OHS (occupational health and safety) and cost issues for producers. We are meanwhile investigating means of enhancing the welfare and well-being of sows in conventional farrowing systems. What is Pork CRC doing to address swine welfare issues in Australia right now? We are researching enrichment of group-housed gestating sows, and this research has, so far, shown that a hanging rope, a formulated enrichment block and straw, provided daily, all have similar effects based on behavioural stereotypies, cortisol levels and injuries through to days 30-40. We are also about to begin work on the impact of a formulated enrichment block on tail-biting but, of course, it is difficult to induce tail-biting behaviour in clinical trial groups. Unexpectedly, other research trials have indicated that higher feeding levels in early gestation, especially for younger sows, improves reproduction; it’s not yet clear if this is associated with reduced aggression or just feed intake per se. A recent project has illustrated the fascinating behaviours of sows within a group. Dr Megan Verdon, University of Melbourne, mixed sows determined to be aggressive or dominant together and compared their welfare and behavioural stereotypies with sows mixed randomly. There were no behavioural effects or effects on welfare – amazed me! Megan also showed that within a group, aggression declined as the variability in parity within the group increased. Conversely, farrowing rate went in the opposite direction and most producers are inclined to group younger/smaller sows together. The University of Melbourne also reported some fascinating results on how sows with different dominance status alter their behaviour to get to feed in floor-fed situations and explores the penalty they pay for how they adapt. For example, dominant sows undergo confrontation more frequently so the instance of injury in these sows is higher; submissive sows avoid the feeding area (and the dominant sows) and receive fewer opportunities to feed; whilst sub-dominant sows take more risks to get feed and undergo both aggressive bouts and reduced feeding opportunity. Interestingly, based on cortisol levels, the welfare status of the subdominant sows was better than for dominant and submissive sows. Overall: fascinating research by excellent scientists. Studies completed by Pork CRC have shown free-farrowing systems to be worse off for piglets and stockmen in initial years and have very little effect on welfare of the sow. Is this true? In one of our commercial research sites, which PhD students and staff are working on, large studies have been conducted using swing-sided pens, of which there are many versions. When they farrowed sows on that site, the piglet mortality was around 3.5 pigs per litter from birth to weaning whereas mortality in the crate was around one per litter. Some pen developers and producers have been able to make alternative farrowing systems work over three years, though with inconsistent weaning results. You can make them work but once you purchase one and implement it, you have 18 months to two years of trying to reduce piglet mortalities and to make that system work. Based on befits for the sow, piglet and producer there seems to be no real alternative to the farrowing crate at the moment. Do you think it’s a matter of sows learning how to behave in an open system? It could be a learning curve, we haven’t done enough continuous research, but other systems have only used the swing-sided pens and after 3 years they have got to the same mortality rate as crates – but at considerable cost. Are alternative farrowing systems and reducing sow confinement things that Pork CRC will continue to work on and develop for animal welfare? Our current projects on free-farrowing and alternative farrowing methods will continue but we’re now turning our focus to enriching the sow’s environment in farrowing crates and improving their affective state and welfare. There’s indications in some of the productive outcomes that even by simply providing straw from the time they enter the crate to when they finish farrowing, has quite a large effect on mortality rate (reduced mortality) before fostering, and beyond fostering to weaning. Something is changing in the sow’s behaviour, just by offering straw during that period. Which areas of pig production do you believe would benefit from changes in current practices? In Australia, pig herds are regularly audited for welfare. In most herds, animal welfare is top of mind and is monitored, and any problems reported and addressed. Group housing gestating sows was one of the best changes ever made by the industry – for the sow and the industry – and has reduced confinement by nearly 80%. New housing for lactating sows and, to a lesser extent, weaner pigs, would help reduce variability but it is a matter of affordability and most producers are suffering negative margins at the moment. Communication: It’s also important for us to deliver our research to producers. It is our responsibility to make scientific papers and developments in swine research accessible to the entire swine industry and illustrate where changes can be made, and what the benefits of adopting these changes will be. It is an exciting field and we have to communicate that excitement to all our stakeholders.